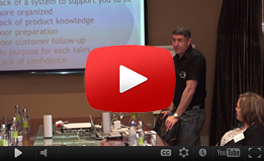 These very “Powerful Workshops” are designed to support, uplift and introduce your sales team to the crucial sales tools and principles they need to optimise their ability to sell. The application of the material, however, starts after the workshop is over, when they listen to the audio book CD’s or MP3’s in their mobile university (their car), use the online sales training solution and engage in accountability partnerships. The sales team is supported with, “Audio Books”, which they will listen to during their commute in their cars, they will also be supported with daily emails, which serve to remind them to take specific action and which guides them on how to apply the specific tools they learned during the workshop. The focused “Online Sales Training Program” will also serve as an additional training aid and will give the sales professional, Andrew and the leadership team, feedback on their progress.